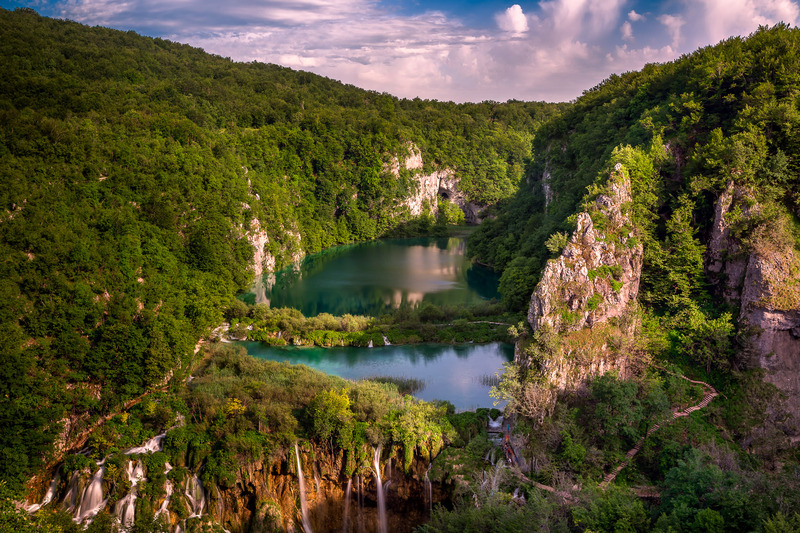 During our visit to Croatia, we decided to visit Plitvice Lakes, famous for its enchanted waterfalls and located far away inland towards the capital city of Zagreb. June 2014, single image, focal length 35mm, aperture f/11, shutter speed 1.6 seconds, ISO 100, 5-stop ND filter, tripod. Part of Unesco World Heritage, the sixteen different lakes are interconnected by waterfalls, and the rich fauna, as well as the fairytale surrounding forests make you feel as if you had landed in the fantasy landscape from Lord of the Rings book. We decided to stay for one night at Plitvice Lakes so I would be able to shoot the sunset and sunrise, without worrying about intendancy and early morning drive. Having booked our hotel at Plitvice Lakes, we drove along the high speed highway, and then onto the smaller winding roads in the mountains, before reaching the lakes and our family guesthouse. It was a real surprise to discover 400 years old farm, located inside Plitvice Lakes Park and owned generations and generations by the family of jovial Volodimir. He made us feel at home with home cooking of local delicacies and personally distilled Plum Rakia and we enjoyed his stories and hospitality as much as the actual trip to the lakes and waterfalls.